Intelligent Manipulation Of The Sun? This is one of those unpleasant discoveries with implications that stagger the imagination. Over the course of three days, a complex repeated variation in solar X-ray measurements and electron output was found. Although complex variations of electrons and X-rays are very common with our Sun, what is not common is a duplication of X- ray flux and electron flux variations over the span of three days. This is practically unheard of. Our Sun generates extremely complex, ever changing waves of energy and magnetic fields that interact with one another in ways not fully understood. Rarely do these variations repeat themselves, especially over three 24 hour periods. Fig. 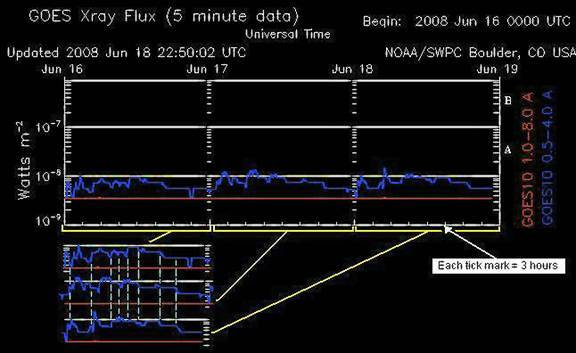 1 ­ X-ray measurements made by GOES 10 satellite over a 3 day period starting June 16, 2008. 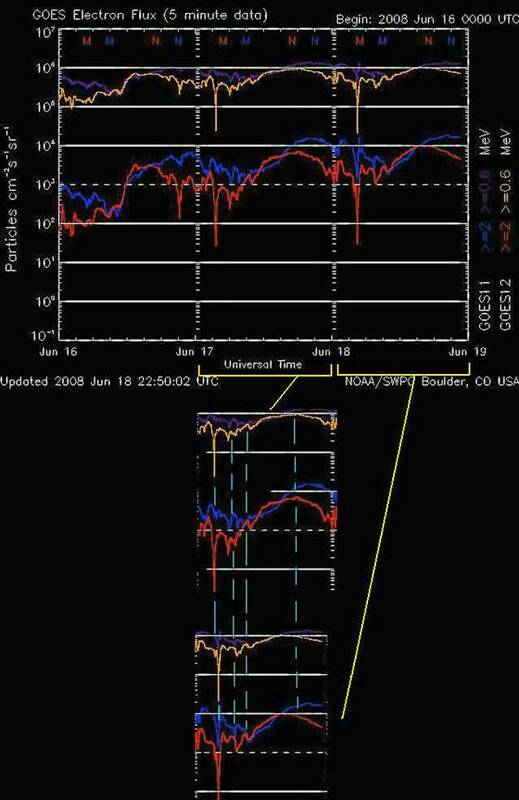 The red line represents a longer X- ray wavelength of 1.0 to 8.0 angstroms, which has strangely been almost flat line over the past several months. NASA claims they have no idea why the red plot line is flat. My theory about the red line is that nothing is wrong with the satellite and that our Sun has gone through a change, possibly a permanent one. This seems most likely since the same CCD chip is used to detect the wavelengths you see here. Opaque filters made of plastics and metal are moved in front of the chip for each X-ray wavelength to be measured. The same CCD chip measures everything you see here. There is feedback to NASA from the satellite that the right filter is in place for a given measurement, but no word of any filter wheel errors has yet to be announced. This problem has gone on since last year. Fig. 2 ­ Electron measurements over a 3 day span are also measured every five minutes by two other satellites, GOES 11 and GOES 12. These satellites provide important independent confirmation that eliminates the possibility of waveform duplication taking place inside any one satellite. All of this waveform duplication is beyond chance and probability. In the past, nothing like this has been observed before with this degree of complexity by this author. I have been continuously been examining these and other solar charts since the early 1990's. Why would someone do this to the Sun? Perhaps these are signature waveforms or tests of weather manipulation. Modifying the solar output will easily manipulate the entire world's weather, but may do so in ways not fully understood. Hence, we recently saw oddities like the hurricane-like formation over the central part of North America and powerful Earthquakes. The Pentagon has already boasted "By 2010 we will own the world's weather." Everyone is constantly looking at HAARP as the cause ­ but that may just be misdirection. HAARP operates in the medium shortwave band around 10MHz. Ham operators and Shortwave listeners have known for almost 100 years that these waves stay contained within the atmosphere and bounce around the Earth between the ionosphere and the Earth's surface, which they call "skip." North American CB radios operate at 27MHz. This is almost triple the frequency of HAARP. Over-powered (illegal) CB radios commonly reach all over the North America and Canada using skip, even in the daytime. HAARP alone cannot reach the Sun no matter how much wishful thinking is employed. It was also the Pentagon that about told us about two years ago: "There will be wars and rioting over food around the world because of weather changes." If a weapon or other weather modification system was directed at the Sun, complex patterns like these would provide evidence for researchers that something is actually occurring to alter the Sun's X-ray and electron output in response to what was directed at the Sun. In other words, these charts may provide successful confirmation for weather control researchers, if solar X-rays and electron changes match a new weapon or weather modification system operation. Perhaps we will bring the events of 2012 upon ourselves without any outside help. Time will tell.